Guwahati City is located over a mountainous terrine in the northeastern section of Assam, India; relatively close to the border of Bhutan. In the mountains you will see a cultural shift from the more common Indian facial features to those who come from China, Tibet and Bhutan. It was uncertain if I was heading in the right direction, for when we were in the mountains it felt cold. Was I going to the Himalayas that were not too far out of reach or was I going to this humid, smoldering hot Indian city? This trash dump, locally known as, Boragaon, has become home to a bird on the endangered species list. Its name is The Greater Adjutant Stork. Standing up to 5 feet tall and with an average wingspan of 8.25 feet, it is distinct in its awkward, ugliness and prehistoric nature. Like vultures, this stork is a scavenger. It likes dirty low wetlands and landfills. It is believed that the bird was placed on the engendered radar due to improvements in sanitation throughout Asia. 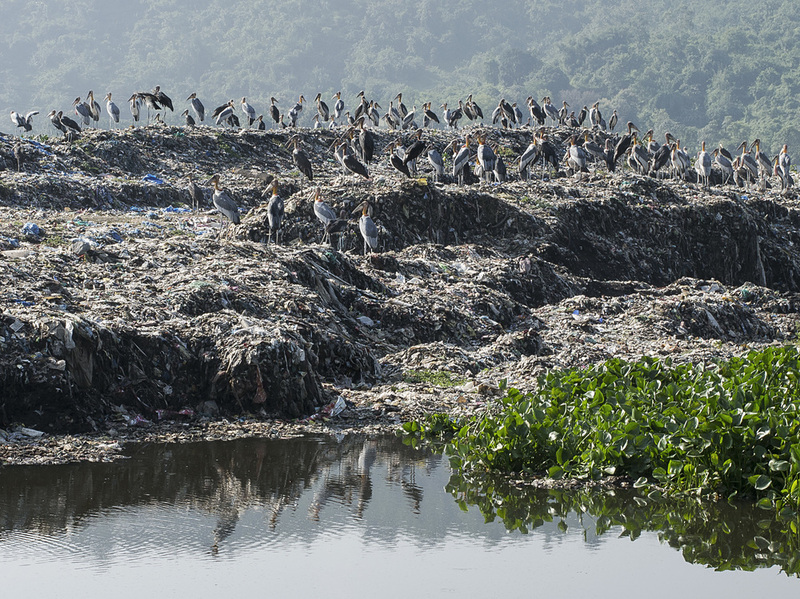 If so, then it's not surprising to find this stork conjuring around trash at Assam, India's largest dumpsites (94 acres) surrounded by swampy land. Dumpsite environments vary from place to place and one thing I noticed here was that the fields of trash felt newer, meaning the smell of methane was lower, even though the area covered by trash was enormous. This area seemed to receive more rain and drainage. Garbage appeared to be more stacked, rather then, compressed and mixed together; leaving more room to breathe. Also, no trash was burning like you would see at other trash dumps. It appeared that the water leaving the dump spread into sectional open wetlands and even though polluted, was diluted by this system. Broken down structures, equipment, trucks and offices accompanied the dump as if it was organized at one time, but later vacated at some point. Parts of it reminded me of an industrial ghost town. Walking on various hills of trash that stretched almost as far as you can see, you were amongst an area covered in animal feces, sludge and randomness. You had to be very careful where to step because two places could look exactly the same, but as one place was hard and secure to step over and the other will drop you into a foot deep of black unknown filth. However, the local people were comfortable walking around barefoot in this. The community at the dump had homes built from woven wood, bamboo and sheets of metal. Some were built on top of trash that stood one to two stories high. Our homes were spread amongst wetlands where the wastewater would drain and dilute. The community is an indigenous one and seemed content with their situation. I have not seen this since I photographed the Amazonian, indigenous Warao tribe that had migrated to a landfill called El Bote in Cambalache (Guayana City, Venezuala). I have found that when people know what modern life is like and then for one reason or another they had to become dependent on landfill life for survival, their reaction is to feel ashamed. Not shy, but ashamed. Some may give strange looks like, "You don't belong here and not welcomed" or otherwise "You are an opportunity to ask for money." However, I have noticed that with indigenous communities, they never had the taste of the larger picture, so they don't know what they are missing outside primitive life. I can attest that not one person asked me for any money or help in both of these indigenous communities. They don't seem phased by my presence. They usually like having their picture taken and instead of myself feeling like an intruder, I feel like a visitor. These people are living in content with their surrounding nature. 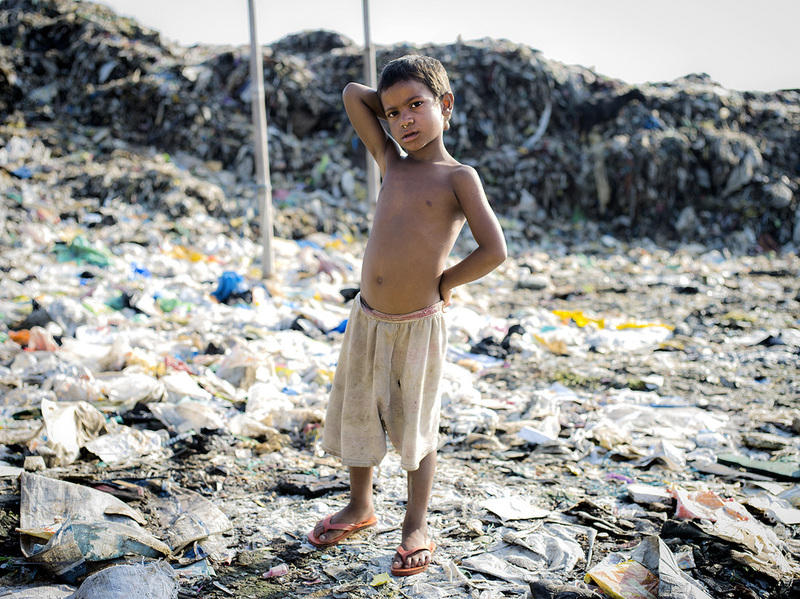 The landfill is just a bonus and free resource for them to add to their lives. With this said, people treated me like another part of their surroundings, they mostly smiled and engaged with me. They were not tainted by a modern world, they had no access to stimulants like drugs and alcohol, and the community seemed small enough that they could work collectively, rather then competitively. However, they may have limited concept of hygiene and sanitation when it comes to allowing oneself to walk, live and breathe in this toxic wasteland. The dump is totally covered with cows and all sorts of various landfill birds. On the outskirts of the landfill are a bunch of wetlands where trash is less present. I had to climb across some bamboo sticks over deep wastewater and on top a long cement wall to reach a few homes out in the distance. Next to one home was a woman with small children surrounding a sick cow. It lay on its side with mucus draining from its eyes and it struggled to breathe. I asked them what happened and they explained that the cow became extremely sick with an illness and they don't know why. I noticed the children surrounding the cow were barefoot and dirty. I wondered if this is how a birth point for a new sickness could begin to spread from an animal to humans. While so many cows were eating and living off the dump, they cared so much about this particular cow. In India, it is believed that the cow is sacred and should never be killed or eaten. This was the first time I have ever seen that much livestock at a trash dump where people were scavenging. I found it interesting that there was a large abundance of cows as potential food source, but the community was not interested in using the cows for meat. Their work is very dirty, but they may not view it the same way as an outsider. During my exit, I crossed paths with two girls who were clean and well dressed. They were happily on their way to junior college. Opportunity and scholarships are available for those who work for it. I felt that the people seemed happy even with the their struggles and testing of survival skills. They worked together as a team for the overall benefit of the community and for that I believe their advancement for a better life can come more easily from their self-sustainment. In terms of municipal waste, any effort to reduce the spread of trash or using it as a resource is in limbo. I have read that there has been or there will be changes to improve these conditions but there is no evidence of that present at this time.